A gold buyer out of Texas, Gracies Gold, is currently using a QSX-79Tplus as a loaner while they wait for delivery of another model. This client has not wasted time promoting the use of X-ray Fluorescence to differentiate themselves from the competition. On the company website, they have a page dedicated to explaining XRF Technology and the benefits it presents to their potential clients selling gold. At Quickshot XRF, we often highlight the benefits that properly used XRF technology will provide to both the sellers and buyers of precious metals. When considering the front end benefits of XRF, our clients consider the number of options that people selling gold have and ask themselves…how am I different from the other gold buyers? Organizations that answer that question by investing in, and promoting, XRF analyzers develop a reputation for offering accurate, and honest, payouts – and reputation extends beyond a single transaction. The question – how are you different than other gold buyers? For an always increasing number of gold buyers, the answer is XRF accuracy. Contact Quickshot XRF to discuss your gold buying business and to learn if XRF is a fit. Gold sellers are getting smarter and have more options on where to sell then ever before…Agreed? WHAT IS THE TAKE FOR YOU, THE GOLD BUYER? People selling gold are going to be more aware of the options they have and shop around more…and they may start looking for buyers that use x-ray fluorescence technology. We have seen reports like this before and this one features the Quickshot XRF QSX-295Tplus. The user of the system pays out based on the highest accuracies and has earned a reputation for his payouts based on XRF…this reputation and the ‘word of mouth promotion’ has helped him increase his gold buying profits substantially. Have you noticed more sellers collecting options before selling? Do you use x-ray fluorescence so that the seller feels they are getting the best option? Are gold sellers more aware of who they are selling to and getting the best value? Quickshot XRF offers several analyzer options for verification of gold and other precious metals. From “entry level” systems to refiner quality analyzers, we can discuss what is critical to your business and offer options to help increase profitability through reputation. One of the most common applications of Quickshot XRF analyzers is the accurate quantification of gold and other precious metals. Having provided solutions to this industry since our first days, we have seen the increased number of gold buyers and the evolution of many. That evolution will typically develop from using simple karat identification tests (acid tests, etc) when purchasing scrap to utilizing the benefits that x-ray fluorescence technology offers in speed, accuracy and reliability. The next phase of evolution is when a buyer that began with a focus on just gold content realizes the need for high accuracy on all precious metals – something that XRF can provide. Whether the interest is just gold or additional precious metals, many buyers will begin melting goods into bars before sending to the refiner and some have actually evolved into refiners. When clients reach the point of melting down scrap, they will sometimes request consultation on the best methods of precious metal assay. The experiences staff of Quickshot XRF can assist with a discussion on various approaches to maximize the accuracy of x-ray fluorescence. One of these methods involves creating pin-dip samples for instant assay; which is a practice used by precious metal refiners as well as gold buyers that melt down scrap. Instant assay of precious metals and karat alloys uses the XRF technique that requires the samples be very homogenous (uniform throughout) in order to achieve the highest accuracy. Homogenous is an absolute requirement. If molten metals are allowed to cool down slowly they usually segregate, or separate, into non-homogenous materials – the outer surface often being richer in gold if it is a karat or scrap. This affects the accuracy significantly since all XRF analyzers measure only 10-25um into the surface of a sample. Molten liquid metal is very homogenous if stirred and mixed. When the molten metal is quickly quenched, or cooled, the uniform distribution of the elements in the liquid metal state is “captured” better and retained in the resulting solid form. Use of hollow vacuum-evacuated glass tubes, called “pin dip tubes”, facilitates taking proper samples for the instant assay. Contact Quickshot XRF staff to request a copy or discuss xray fluorescence for precious metal assay. As we enter the New Year, QSX Instruments Inc is very excited to release a new software package for our popular X-ray Fluorescence analyzers. A focus during the last quarter of 2011 was to complete the updated software package for QSX desktop systems built for detecting gold and other precious metals – the QSX-79T, QSX-79Tplus, the QSX-295T and the soon to be released QSX-295Tplus. 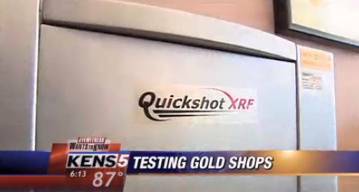 These new benefits enhance the experience for gold buyers that choose Quickshot XRF systems for their quality, performance and value. All the bench-top systems continue to include a clean interface from the computer to the chamber…meaning no additional cards or software while using a simple USB connection; which is beneficial should any computer issues arise. The software also allows for a customizable library of precious metal spectrums (great for buyers of dental scrap and coins), a color camera interface and excellent report generation capabilities. Contact a Quickshot XRF Sales Associate to learn more about the new software, coordinate a web-cam demonstration or to discuss the benefits that XRF technology can offer your gold buying business. As many of you know, when gold prices spiked their was an increase in gold buy-back organizations starting up. Many serious gold buyers turned to x-ray fluorescence technology to separate themselves from other gold buyers. This is one major benefit of XRF but if the wrong system is selected then the accuracy and range of metals may not meet a buyers interest. When the interest in x-ray fluorescence was growing, many sales organizations suggested proportional counter detection systems (aka ‘prop count’) to meet gold buy-back interests. They promised accuracy across a range of precious metals…but that is simply not what a ‘prop-count’ system can offer. You can request literature to learn more about the difference in performance that detection systems can offer (request 79T v 295T comparison) or contact a QSX Instruments technical advisor to discuss your current buy-back operation and, possibly, XRF Analyzer.